Friday Film: Pelicans edition! New Orleans played a pair of close games recently, one against Chicago that went to double overtime, and another against Houston that the Pelicans won by two. There was so much that happened in those games that this week’s Friday Film will pull from the fourth quarter and overtime of just those contests. The Pelicans went to the same simple set again and again at the end of their game against the Bulls: a Jrue Holiday/Anthony Davis pick-and-roll with DeMarcus Cousins behind the three point line, aka a spread pick-and-roll. Even though it was a simple set, the Bulls struggled to guard it. From the 4 minute mark in the 4th quarter until Anthony Davis fouled out with 2 minutes left in the first overtime, the Pelicans ran this set 7 times. Of those 7 possessions they ended up with 4 shots at the rim, one shooting foul drawn, one open three, and a midrange pullup, for a total of 9 points — and the Bulls were lucky it wasn’t more based on the quality of these looks. 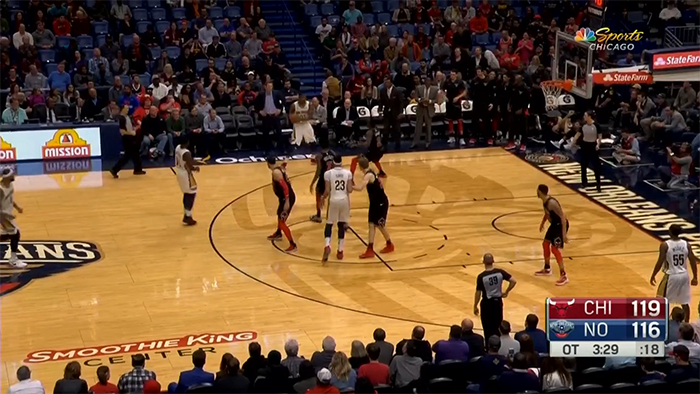 On the first play the broadcast cuts to the pick-and-roll just as Davis is rolling out of his screen. Lauri Markkanen comes out high on this play, almost trapping Holiday. Holiday threads a pass in between the defenders to the rolling Davis. Robin Lopez, guarding DeMarcus Cousins in the corner, slides in to wall off the paint, pointing to Markkanen to switch out onto Cousins. But Markkanen is late, and Cousins drains the wide open three. The next time down the floor is similar, though Cousins this time is at the top of the key instead of in the corner. Markkanen once again comes out high but can’t contain Holiday, letting him get to the rim. We can see the Bulls’ expected off ball rotations: Zach LaVine is the low man (i.e. the man closest to the baseline, lowest on the floor), so he rotates over to protect the rim. Justin Holiday sinks in to take away the potential pass to Moore cutting in behind. The help didn’t do much. The Bulls were lucky to escape with no points allowed. 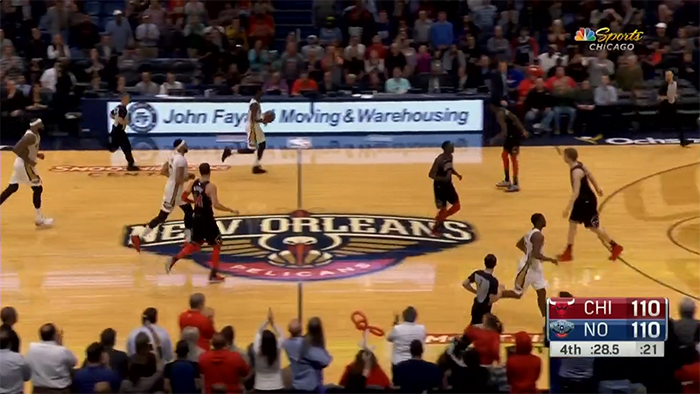 A few minutes later the Pelicans returned to this spread pick-and-roll. This time Markkanen plays further back, attempting to keep both the ball and the roller in front of him. But this is a difficult task for a young player with Davis rolling. He takes one false step toward the ball, Holiday sees it and throws the lob, and Markkanen can only hope to get to the pass before Holiday releases it. It slides by his fingertips on the way up, and Davis puts it down. This is a very difficult action to stop without some help from the off ball defenders. Mirotic didn’t slide in on this play to tag Davis, as would usually be expected. It’s hard to know what the Bulls expected of Mirotic, but standard NBA pick-and-roll defense would dictate that Mirotic was more at fault than Markkanen. 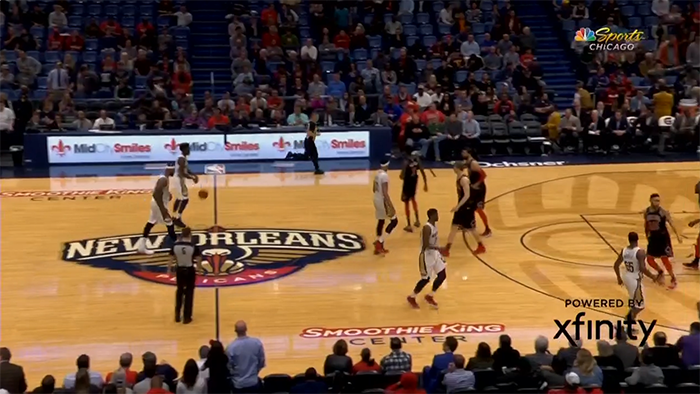 With the game tied and the click winding down, the Pelicans went back to this play to put them over the top for good (or at least they hoped). Markkanen comes out high above the screen, Holiday hits Davis on the run, and the Bulls’ off ball defenders shift over. Holiday and LaVine are both in the paint, but it’s not clear how much resistance they really present to an on-the-move Anthony Davis. We never find out, because David Nwaba swipes in at the ball out of desperation and gets all elbow. Davis sank both free throws to give the Pelicans the lead. After a last second foul by the Pelicans, the game headed to overtime where New Orleans went right back to what had been working. The Bulls have adjusted. Now they’re playing Markkanen way back, making sure Davis doesn’t get the ball — at all costs. As Holiday comes off the screen, Lauri fakes a little at him but just runs right back to Davis. But that leaves a wide open lane to the rim. That’s where Jerian Grant, the low man, comes in. He takes the rim while Valentine sinks into the path of any potential pass to Grant’s man in the corner. Grant, though, is not the world’s most imposing help defender, and Holiday is able to float by him and scoop a left handed layup up off the glass — but leaves it short. Grant’s presence was enough to make Holiday alter the shot, but Holiday still likely finishes a shot like this more often than not. A minute and a half later the Bulls go back to this same spread pick-and-roll, and the Bulls have changed up the coverage again. 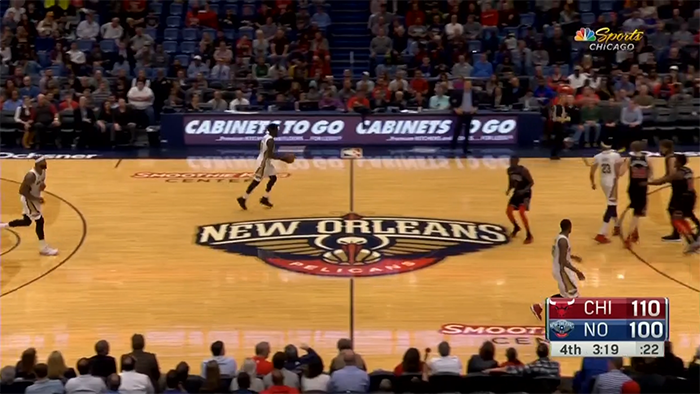 Justin Holiday scoots under the screen, giving his brother, Jrue, a wide open midrange pullup. This is perhaps the least of all evils, but it’s still not great defense. Jrue Holiday has made over 50% of his midrange pull-ups so far this year, according to NBA.com, a mark which includes shots that are more contested than this one. 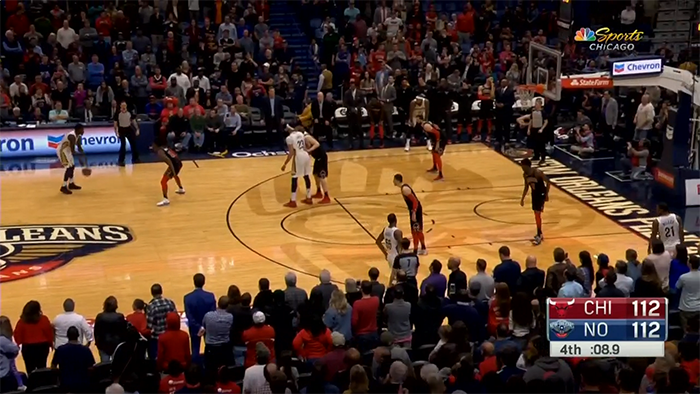 Even if, for a variety of reasons, we might not expect the probability of this shot going in to be the quite that high, it’s still not a bad shot for the Pelicans. The seventh and final time the Pelicans run this play, they’re able to get a dunk even though the Bulls try and go under again. 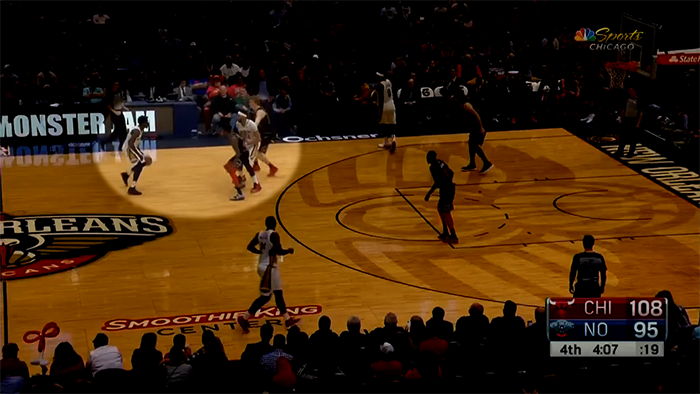 Davis’ screen takes a beat longer to get around for Justin Holiday, so Jrue has an open lane to the rim. He hesitates for a second to let Jerian Grant’s stunt clear; meanwhile, there’s a miscommunication between Markkanen and Justin Holiday. 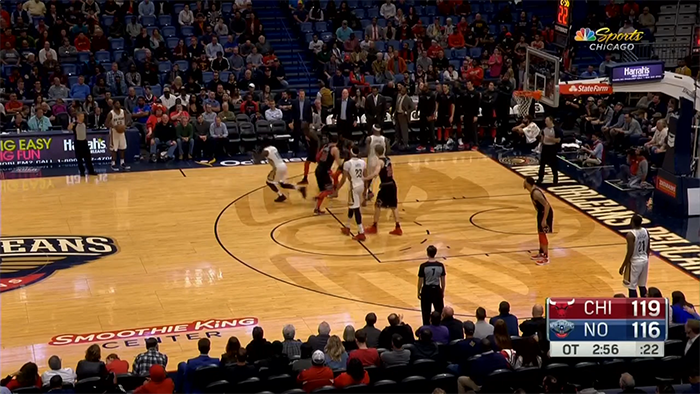 Holiday can’t recover to Jrue at this point, so he seems to think it’s a switch and retreats to Davis at the same time Markkanen does. Denzel Valentine is the low man, but was clearing himself from the paint to avoid a defensive three second violation. By the time he realizes he should have stayed, it’s too late, and Holiday gets a dunk. A fitting coda: the perfect storm of miscommunications and mistakes of execution. This is a difficult setup to defend for anyone. For a team as young as these Bulls, the pressure put on their defense by this simple spread pick-and-roll was just too much.